On the morning of March 10th, you will be welcomed home, to the Land of the Bible! You will go through Israeli customs, and proceed to claim your bags. Note: Your passport must be valid until October 1, 2015 due to Israeli regulations. The group will be met by Pastor Kelley, our guide, George Mascobi and another Templeton Tours representative. After we get our bags to the bus, we will board our coach and immediately begin our tour. After we stop for lunch, we will head toward the south and visit the Valley of Elah, where David defeated Goliath. We will then head toward the Mediterranean Sea to the outskirts of Tel Aviv, and visit Joppa, where a few events from the Old Testament and New Testament will be remembered. After this, we will proceed to our hotel. There, the hotel will handle your bags as you get ready for dinner. If the weather is nice, you may want to enjoy a relaxing walk on the Mediterranean before you retire for the evening. And yes, you will sleep well. On Wednesday, March 11th, we will get up early and have a great breakfast. We will board the coach and head toward the place where the Apostle Paul was kept until he was sent to Rome. We will stand in the Roman theater where he stood before Agrippa, and more. From there we will continue to Mt. Carmel, the site of Elijah’s triumph over the prophets of Baal. After lunch, we will go to one of the oldest cities of the Holy Land. It is said one section predates Abraham. Solomon had stables here, as well as an amazing water supply system. This city lies along the same valley as Mt. Carmel, the Valley of Jezreel. The city’s name is Megiddo. Yes, the valley is also where the Battle of Armageddon will take place. From there we will travel to Nazareth, the boyhood home of Jesus. We are going to try to get into one of the oldest churches. Inside this building is a springing well that is more than 2000 years old, and no doubt, Jesus drew water here for his mother. Tradition says it is at this well where the angel appeared to Mary to tell her she would birth the Son of God. We will also visit the precipice that overlooks the valley, outside of the city. Here is the place where the men of Nazareth wanted to throw Jesus down headlong, and He walked through the midst of them. We will end the day at our hotel in Tiberias, on the shores of the Sea of Galilee. Thursday, March 12th, after breakfast we will walk down to the dock and board a boat and take a ride across the Sea of Galilee. While on the water, we will point out some important geography and have a time of worship. Imagine as you see the places of many of the miracles of Christ! We will then dock at a museum where they house a small boat, called the “Jesus Boat.” It is believed to be from the time of Jesus. We will then travel to Tabgha, where it is believed that Peter was restored after his denial of the Lord. After this, we will go to the city of Peter, and where Jesus spent much of his ministry, the city of Capernaum. After lunch, we will ascend to the Mount of Beattitudes above the Sea of Galilee. Here we will remember the Sermon on the Mount. We will board our coach again and go north to the site of Caesarea Philippi. This is where the springs form the source of the Jordan River. We will go to the Scriptures and see one of the greatest confessions that Christ is Lord. From several points, you will be able to see Mt. Hermon. We will make our way back as we travel through he Golan Heights. An amazing view of the Sea of Galilee will be seen from the Peace Vista overlook. We will return to our hotel in Tiberias for our evening meal, and another great night of rest. The brochure states we will baptize on this evening, but we have made a change. Instead of baptizing in the more “tourist” spot on the Jordan, time permitting, we will baptize at Bethbara. This is where Jesus was actually baptized. The site has recently begun allowing baptisms. None of my other tours have baptized at this location. It is worth the attempt. On March 13th, we will leave Tiberias very early. Time permitting, we are going to try to go into Samaria and visit Jacob’s well. This is another site Pastor Kelley has not visited. Here we will remember how Jesus met the woman and told her He was the Messiah. We will then travel by the springs where God revealed to Gideon those that were to fight with him against the Midianites. The brochure mentions Bet She’an. It is an excavation of a city from the time after Christ. It is the area where the bodies of Saul and Jonathan were hung. We will probably not have time to visit this city along with Jacob’s well, but we will see. From here, we will travel down through the Jordan valley to one of the oldest cities in the world, Jericho. From here we will see the traditional Mount of Temptation as well as excavations of the ancient walls. After lunch,we will make a brief stop at a Sycamore tree, remembering the story of Zachaeus. From here we will stop at Bethbara, where John baptized Jesus. Other historical/Biblical events will be pointed out as well. This is also where I want to attempt baptism this time. The cost will be about $10 if you want to be baptized. This could change, but worth the attempt. After this, we hope to go ahead and stop at Qumran to see the caves where the Dead Sea Scrolls were found. Our hotel this evening is located on the shores of the Dead Sea, 1,300 feet below sea level. The lowest spot on earth. Shabbat Shalom! The Jewish Sabbath begins when three stars can be seen on this evening. On Saturday, March 14th, after a delicious breakfast, we will travel south to the Masada fortress. We will ascend by cable car to the heights of the magnificent ruins of the place of the last stand of the Jedean revolt against Rome. It was a palace of Herod at one time as well. We will then go to see Ein Gedi, an oasis in the desert by the Dead Sea, where David hid from Saul. During the afternoon, we will give you a chance to rejuvenate. You can go take a dip in the Dead Sea, where it is so dense you cannot sink (hint, don’t try to swim). Or you may want to visit the spa in our hotel. You may want to take a walk through the area, or even take a nap. Other options may or may not be available. On Sunday, March 15th, we will visit the Valley of the Shadow of Death. It is a real place to which David referred in his twenty-third Psalm. After this, we make our ascent to the city of Jerusalem! As we arrive to the capital of Israel, we will stop on Mount Scopus and have a traditional welcome that dates back to the time of Abraham. We will proceed to Bethlehem, if the situation permits, and have lunch. Then we will take a short drive to the Church of the Nativity that is built over the cave where Jesus was born. We will then proceed to the Shepherd’s Field and plains of Boaz. Time permitting we will visit one of the famous Bethlehem gift shops before returning to our hotel. On March 16th, we will go to the Mt. of Olives for a breathtaking view of the city of Jerusalem. We will then go to the Old City. We will stop at the Southern Wall excavation site. This is a place where you will walk on stones where Jesus really walked as He would enter the Temple that stood there during His time. He taught from these locations. 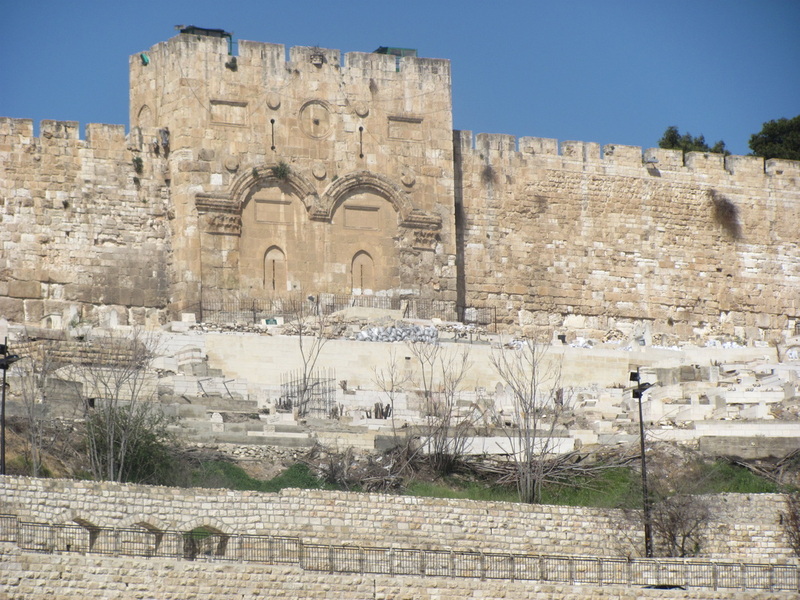 If it is open, we will ascend to the Temple Mount area where the Temple once stood, until it was destroyed by Rome in 70 A.D.
We’ll continue our walk through the Old City to the beautiful St. Anne Church. Here is a favorite spot to sing! Located right beside this site is the Pool of Bethesda. Our day will conclude with a visit to the Yad V’Shem, a museum built in memory of the Holocaust where 6,000,000 Jews and many others, were murdered by the Nazis during World War II. On Tuesday, March 17th, we will begin with a visit to the Western Wall. We will take time to approach the wall where faithful Jews still pray for their Messiah will come, and some pray for a new Temple to be built. This is the spot they consider to be the closest to where the Holy of Holies was. It is an honor to pray among them, and pray for their souls. Also, take the time to pray for whatever else you may desire. I encourage you to write down your most precious prayer requests and leave the small note in the wall. It is a great memory. From here we will visit the tunnel excavations of the Temple site. Our next stop will be the Antonia Fortress, site of Pilate’s Palace. Here you will see the real beginning to the “Via Dolorosa” that Christ walked. You will be able to kneel down and touch the stones from the time of Christ and thank Him for His sacrifice for us. As we leave we will walk through the old colorful market and through the restored Jewish Quarter. We will proceed to the traditional site of the Upper Room, where the Last Supper of Christ occurred and the fire of the Holy Spirit fell on those that tarried in Jerusalem according to the command of the Lord. After lunch, we will visit the Shrine of the Book Museum where some of the Dead Sea Scrolls are kept. We will also visit the Model City of Jerusalem, a 1:50 scale model of Jerusalem as it was during Jesus’ time on earth. We now come to our last day in Israel, Wednesday, March 18th. We will begin with a visit to the Garden of Gethsemane where Jesus often prayed, and was betrayed. We will have a place reserved in a private garden, and have a devotion time and personal prayer. We will then walk down the Mt. of Olives on the same route that is believed to be the path of the Triumphal Entry, and how Jesus was taken after He was betrayed. We will then drive to the recent archaeological discovery of the Pool of Siloam. This is the place where Jesus told the blind man to wash the mud from his eyes so he would see. After this, we will proceed to the House of Caiaphas where Jesus was held before being taken to Pilate, and where Peter denied Christ three times. We will walk to the end of this property and see where two valleys meet, and a potters field is believed to be located. Possibly the very field where Judas cast himself from the side of the hill after betraying Jesus. We will conclude this day with a visit to Calvary and the Garden Tomb, a peaceful spot where we can remember Christ’s crucifixion, burial, and resurrection. Here, after entering the Empty Tomb, we will share in the Lord’s Supper. We will return to our hotel for our last evening in Israel. Usually our tours require us to leave late on the evening of the last day, but not this time. We will get a good nights sleep. Then, on the morning of March 19th, we will have breakfast and then transfer to the Tel Aviv airport for our trip back to the USA. You will arrive home that evening with your life changed, and memories that will last a life time. Your Bible reading will be changed, and you will be changed for the good. Just in case you missed it, all meals, every day in Israel, are provided. We will even have water and sodas provided for you on the bus. The only extra expense you will have is in some of the hotels, or places we eat lunch, they may not provide what you want to drink. You will have other options if you want them. Those drinks, extra snacks, souvenirs, and the baptism in the Jordan are the only extra expenses. Our trips have no hidden charges. This is an overview, and from my experience, some of these things will change. It is unavoidable. The schedule is our starting point. Some of the places we visit require appointments. So that will change our schedule some. But rest assured, we will work hard for you to see everything we can, and even add in some things if possible. Bring your walking shoes, hiking stick, great spirit, and determination. I will push us to see and do all we can. There is a lot of walking, especially in Jerusalem. And it is good for us! I tell everyone, this is not a vacation, it is a life changing pilgrimage to the Land where God chose to put His Name! This trip has changed my life. Every time I go, it does more for me. I hope you can go. We only have 50 spots reserved at this time. Sign up today if you can, $250 will reserve your spot. All pricing is based upon double occupancy. Send me a message if you have any questions. 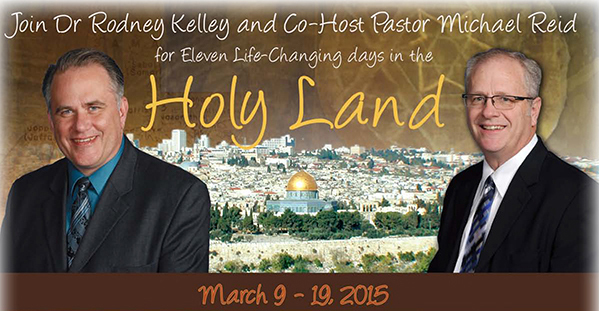 Come join us for a life changing trip to the Holy Land!